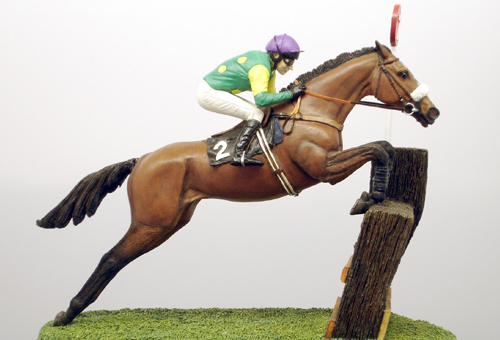 '’Kauto Star’’an outstanding athlete, with a world record tally of 16 grade one steeple chase wins is now regarded by many as one of the greatest chasers of all time. The only horse to have won the King George VI Chase five times, was Champion chaser four times and the only horse to regain the Cheltenham Gold Cup. Ruby Walsh is quoted in the Racing Post saying ''I've ridden a lot of very good horses but he was the best''. 2015 - the year we lost a legend, rest in peace kauto Star. This sculpture has been seen and approved by Champion Trainer Paul Nicholls! This is a one off Limited Edition of 500 worldwide. £275 + £11.50 p&p (UK mainland only)For a limited time only Now £199! Dimensions: L: 11.25 inches. W: 7.25 inches. H: 9.25inches. Materials: The sculpture is cast in resin, hand crafted and hand painted.